And one additional note, the next Carding novel, The Dazzling Uncertainty of Life, will debut in this space on April 7. Twelve weekly installments will be delivered right to your inbox. Tell your friends to subscribe so they can enjoy it too. 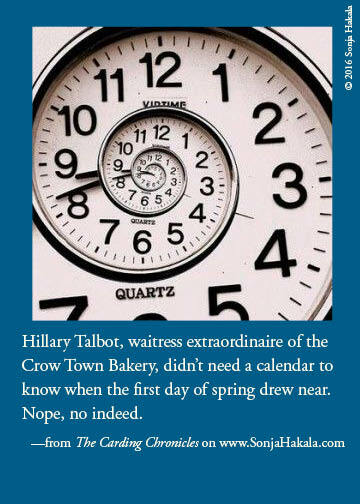 Hillary Talbot, waitress extraordinaire of the Crow Town Bakery, didn’t need a calendar to know when the first day of spring drew near. Nope, no indeed. Suddenly, no one wanted soup. Suddenly, the booths by the front windows filled up earlier, and stayed crowded longer. Suddenly, the conversations over eggs and toast changed from how much wood was left in the woodpiles to talk about maple sugaring, spreading manure on the local fields, and bear sightings. “More coffee, Sam?” Hillary asked. “Oooh, any chance you’ll be making sugar on snow any time soon?” Hillary asked. Sugar on snow is made by pouring stripes of hot maple syrup over trays of packed snow. The result, if the sugar content of the sap is high enough, is a sort of taffy that’s rolled around a wooden coffee stirrer, and savored with a pickle or two to cut the intense sweetness. Hillary heard Sam’s laugh, clear and strong, as she moved toward another table. Edie nodded, and glanced at Hillary. The younger woman was renowned for her striking hair embellishments and wild socks. But the scarf twined around Hillary’s hair was rather subdued this morning, only one shade of purple, and when Edie looked down, she noticed that HIllary’s socks were only one shade of pink. “I’ve overdue for laundry,” Hillary laughed, seeing the direction of Edie’s gaze. “These are my every-day. Nothing special.” She wandered off with her half-full pot. “Hmmm, big date?” Hillary asked. “Yeah, but not the kind you’re thinking of,” Gideon said. Then he blushed a deep shade of scarlet, and Hillary raised a single eyebrow. Gideon stood up. He had no intention of telling anyone about the sale of his house before the paperwork was signed. He’d been able to keep his purchase of two acres on Half Moon Lake under the radar, and he wanted to keep it that way to avoid uncomfortable questions from his father. Hillary watched him clatter out the door as she refilled her pot. “Who are we talking about?” Agnes Findley asked as she slid into the booth opposite her partner, Charlie. Ruth sipped, and then dove headfirst into the conversation at her table. Hillary groaned for her sister (how was she going to break this to Amy?) as she headed back to the main coffee machine with her now-empty pot. The bell on the bakery’s front door jingled once, twice and then three times, admitting a state police officer, Paula Bouton (Carding’s town manager), and Ted Owen, the postmaster. Amy would have to wait. The next Carding Chronicle will be published on March 25. If you are enjoying these stories (they’re a great break from politics, eh?) please encourage your friends to subscribe.